What type of boondocker will you be? This is an important question for you to think about prior to trying out dry RV camping. Are you going to be a tourist and spend the night in a Wal-Mart parking lot? Then make sure you do not get too relaxed at locations such as this. People tend to take advantage of RV store lots and other miscellaneous parking lots, such as Wal-Mart, and try to spend a long term stay there. This is not recommended and deemed as disrespectful among other boondockers. By indulging in your newly found motor home space and pulling out the awning and the lawn chairs, you are not being very discrete. Being indiscreet, you are drawing attention to yourself and abusing a new or used recreational vehicle benefit that other RVers might wish to take advantage of. City or country side boondocking? As an RVer traveling in your new or used recreational vehicle, you might decide to travel across the United States with your spouse, or you might decide to travel from city to city with your family trying to check out all of the amusement parks. Whatever your new or used recreational vehicle traveling destination might be, take some time to know where you are welcome with your RV and where you are not. For example, there are certain city parking lots that will more than likely accept your boondocking of your new or used recreational vehicle without any fuss. Some of these places are: certain Wal-Mart parking lots; some mall parking lots; some casino lots; even some hotel/motel lots. If you do not feel as though you can be discreet, then ask permission. Sometimes establishments will give you a sort of pass or coupon to place in your windshield. If you are going to be traveling across the country and wish to park your motor home in nature, then there are governmental rules you should read and be knowledgeable about. There are also monthly park permits you might want to take a look into. BE SAFE! By spending the night where there are no commercial hook ups or official camp areas in your new or used recreational vehicle, you are inadvertently putting yourself at risk. Just take some simple precautions and you will be fine. Pay attention to other people around your new or used recreational vehicle. Do your dog walking and rest area potting while it is still light outside. Also, make sure you do not talk to or offer to give ANY stranger a ride. This is important to think about whether you are boondocking or not. Be alert, be smart, and enjoy yourself and your dry camping experience. If you advertise that you are a full time RVer, then people will know that you have the majority of your prize possessions inside the motor home you are in, which can make you an easy target. 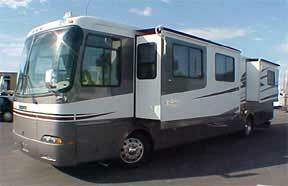 Keep your new or used motor home in its best condition. Do a once over prior to hitting the road. Be courteous and respectful of others. Clean up after yourself. Do not stay when your tanks are full and make others around you miserable. Help out your fellow RVers in making the whole world welcoming for careful, cautious boondockers.